One of our readers, with MS, referred me to the paper below that shows in Finnish men sauna protects them from developing dementia and Alzheimer’s disease. The question she posed is could sauna protect pwMS from MS-related dementia? I think we need to step back and ask whether or not the protective effect of sauna against age-related dementia is simply and association or is it causal? This is were a simple observation needs a lot of research done to separate out association vs. causation. Is there a mechanism by which intermittent heating-up of the body, similar to that which occurs in a sauna, is neuroprotective? Yes, possibly. We know that heating cells triggers the so called heat-shock effect that has been shown to be neuroprotective. The latter could be studied in more detail using an animal model and if we could dissect out the molecular pathway responsible for the neuroprotective effects of heating we may be able to design a drug to switch on the pathway rather than relying on intermittent heating using a sauna. This drug could then be used in other diseases for, for example MS, to see if it helps prevent MS-related dementia. Another way of taking this observation to the next level we would have to do a randomised controlled trial of sauna to look for a treatment effect. However, this is easier said than done. It will be very difficult to do a randomised-controlled trial of sauna vs. non-sauna as a potential preventive strategy against dementia. Imagine how difficult it would be run this study. The question asked would I recommend regular saunas to pwMS based on this observation? Difficult as pwMS are generally very heat sensitive and there is an old literature suggesting the neurological deficits induced using the hot-bath test may not be reversible (see below). I therefore would suggest we leave saunas off the treatment-list of MS-related dementia until the science behind the Alzheimer’s and age-related dementia observation gets explained. My hope is that if this is a causal effect we may be able to find druggable targets to develop a drug that can then be used in MS without exposing them to heat. Laukkanen et al. Sauna bathing is inversely associated with dementia and Alzheimer’s disease in middle-aged Finnish men. Age Ageing. 2016 Dec 7. 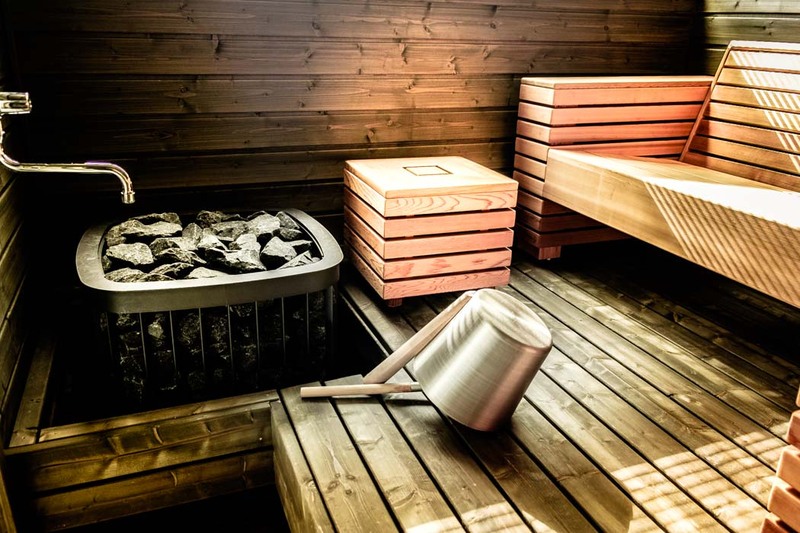 METHODS: The frequency of sauna bathing was assessed at baseline in the Kuopio Ischaemic Heart Disease population-based prospective cohort study of 2,315 apparently healthy men aged 42-60 years at baseline, with baseline examinations conducted between 1984 and 1989. Hazard ratios (HRs) with 95% confidence intervals (CIs) for dementia and Alzheimer’s disease were ascertained using Cox-regression modelling with adjustment for potential confounders. RESULTS: During a median follow-up of 20.7 (interquartile range 18.1-22.6) years, a total of 204 and 123 diagnosed cases of dementia and Alzheimer’s disease were respectively recorded. In analysis adjusted for age, alcohol consumption, body mass index, systolic blood pressure, smoking status, Type 2 diabetes, previous myocardial infarction, resting heart rate and serum low-density lipoprotein cholesterol, compared with men with only 1 sauna bathing session per week, the HR for dementia was 0.78 (95% CI: 0.57-1.06) for 2-3 sauna bathing sessions per week and 0.34 (95% CI: 0.16-0.71) for 4-7 sauna bathing sessions per week. The corresponding HRs for Alzheimer’s disease were 0.80 (95% CI: 0.53-1.20) and 0.35 (95% CI: 0.14-0.90). CONCLUSION: In this male population, moderate to high frequency of sauna bathing was associated with lowered risks of dementia and Alzheimer’s disease. Further studies are warranted to establish the potential mechanisms linking sauna bathing and memory diseases. Berger & Sheremata. Persistent neurological deficit precipitated by hot bath test in multiple sclerosis. JAMA. 1983 Apr 1;249(13):1751-3. For a half century, the hot bath test has been used as a “diagnostic test” in multiple sclerosis. The appearance of new neurological signs or aggravation of preexisting signs generally is transient, with resolution on return of body temperature to normal. We have observed four patients, however, with considerable and prolonged neurological debilitation after hot bath testing. We suggest caution in the application of such testing. I've read that when finishing off a daily shower a short burst of cold water can improve the immune system and blood circulation. This is for healthy individuals but could it help pwMS? I have PPMS and do this every morning in the shower. It sorts me out proper. I keep it cool. I go on my scooter in this cold weather wearing a T-shirt. Love it. I'm saving up for an a/c unit now. Sorted. Reading more into it there are more benefits of the cold water shower blast. Increased alertness. More white blood cells are released in the body to fight infections. Increase in testosterone in men. I tried the cold shower blast this morning for a few seconds haha. In Finland those who take a sauna sometimes follow with a roll in the snow or swim in the lake. Could it be this shock to the system (of the cold) that is part of the beneficial process, rather than just the sauna?? Since a relapse causing loss of feeling/movement of entire left side, if I have the water too warm in the shower I can't lift my left arm to wash my hair. I dread to think what a sauna would do. I also wanted to ask you that question and whether pwMS can/should use the sauna. It's clear from your answer that we cannot use it as part of the treatment-list and the publication from 1983 suggests that it may even be harmful. Would you agree with that statement and would you advise pwMS to stay away from saunas or can they use them every now and then? Re: "Would you agree with that statement and would you advise pwMS to stay away from saunas or can they use them every now and then?" It is horses for courses. There are some pwMS who have no obvious neurological deficits and no heat intolerance who would cope with a sauna without problems. On the other end of the spectrum there are pwMS who are very heat sensitive and if they raise their body temperature, even by a small amount, can't mobilise. In these people clearly a sauna would not be a good idea. Until we have more science and data it is hard to give you an answer that is evidence-based. I would therefore say if you are going to try a sauna do it carefully, possibly with a partner or friend, who can help you if you run into problems. I would not based on this paper recommend saunas as a treatment for MS.
OK but in that case… how can we exercise because that will also warm our bodies up and cause neurological poblems. The heck are we meant to do? Re: "The heck are we meant to do?" Try find an exercise routine that works for you. Some people who are very heat sensitive end up swimming; heat transfer is more efficient in water and hence the accompanying rise in body temperature is lower than with other forms of exercise.